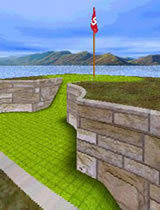 Harry Putter's Crazy Golf PC Edition ia a classics sports game free download & try! Is an exciting crazy golf game, utilizing our custom Ray Casting engine to bring you a convincing and fun 3D playing environment. The 3D element brings an extra dimension to the game (no pun intended). Guiding your ball over uneven terrain, bouncing round blind corners and chipping the ball onto ledges and over obstacles are only some of the things you will need to master. Some holes can only be completed by rolling over strategically placed switches revealing ramps or hidden passages, whilst others require use of automatic lifts to achieve your goal. A high scores table keeps track of your best rounds, so get practicing and challenge your friends. Practice makes perfect and soon you will be finding many alternative methods of finishing each hole under par. The obvious route isn't always the quickest! A practice mode lets you play selected holes so you can try different tactics to play them. A multi-level undo feature lets you step back and replay shots. Harry Putter's Crazy Golf PC Edition is an exciting crazy golf game, utilizing our custom Ray Casting engine to bring you a convincing and fun 3D playing environment. Demolition Derby & Figure 8 Race v1.22 - All crashing, all the time! This game takes the most exciting part of racing and packs it into an incredibly detailed simulation of this little known but adrenaline packed sport. Concrete Bowling v3.0 - Backed by a stable physics engine, you will be able to accurately simulate advanced bowling techniques like hooking, action, entry angle adjustment and breakpoint management. Golf Master II v2.9 - A wide range of gross, net, and gross/net sorts are featured including Skins, Regular, Hidden Hole, Best Ball, Stableford (Points) and Callaway. Christmas Tale - Is a brainwashing logic game which takes you in alluring journey where you have to light Christmas trees, and by avoid fun different obstacles. Word Mash v3.7 - Three entertaining and addicting word games included in one! Cowboy Words, Drop Letters and Crazy Flippers completely different games where your objective is to make as many words as possible in the allotted time. EcoBall - Is a remote controlled ball capable of collecting the dangerous gases out of the air. Nether Star - Your mission is to fly through huge hordes of enemy starships and to kill the head of the aliens - Commander Lord-Marshall. Air Strike 3D - The ultimate helicopter game with great graphics and gorgeous effects.